This article is about battery electric cars. For the more general category of electric drive for all type of vehicles, see electric vehicle. For cars with electric motors and internal combustion engines, see plug-in hybrid electric vehicle. For fuel cell cars, see fuel cell vehicle. Charging an electric car can be done at a variety of charging stations, these charging stations can be installed in both houses and public areas. The two all-time best selling electric cars, the Nissan Leaf and the Tesla Model S, have EPA-rated ranges reaching up to 151 mi (243 km) and 335 mi (539 km) respectively. The Leaf is the best-selling highway-capable electric car ever with more than 400,000 units sold globally by March 2019, followed by the Tesla Model S with 263,500 units sold worldwide by December 2018. As of December 2018[update], there were about 5.3 million light-duty all-electric and plug-in hybrid vehicles in use around the world. Despite the rapid growth experienced, the global stock of plug-in electric cars represented just about 1 out of every 250 vehicles (0.40%) on the world's roads by the end of 2018. The plug-in car market is shifting towards fully electric battery vehicles, as the global ratio between annual sales of battery BEVs and PHEVs went from 56:44 in 2012, to 60:40 in 2015, and rose to 69:31 in 2018. The Tesla Roadster helped inspire the modern generation of electric vehicles. In 1884, over 20 years before the Ford Model T, Thomas Parker built the first practical production electric car in London using his own specially designed high-capacity rechargeable batteries. The Flocken Elektrowagen of 1888 was designed by German inventor Andreas Flocken. Electric cars were among the preferred methods for automobile propulsion in the late 19th century and early 20th century, providing a level of comfort and ease of operation that could not be achieved by the gasoline cars of the time. The electric vehicle stock peaked at approximately 30,000 vehicles at the turn of the 20th century. In 1897, electric cars found their first commercial use in the US. Based on the design of the Electrobat II, a fleet of twelve hansom cabs and one brougham were used in New York City as part of a project funded in part by the Electric Storage Battery Company of Philadelphia. During the 20th century, the main manufacturers of electric vehicles in the US were Anthony Electric, Baker, Columbia, Anderson, Edison, Riker, Milburn, Bailey Electric and others. Unlike gasoline-powered vehicles, the electric ones were less noisy, and did not require gear changes. Advances in internal combustion engines (ICE) in the first decade of the 20th century lessened the relative advantages of the electric car. Their much quicker refueling times, and cheaper production costs, made them more popular. However, a decisive moment was the introduction in 1912 of the electric starter motor which replaced other, often laborious, methods of starting the ICE, such as hand-cranking. Six electric cars held the land speed record. The last of them was the rocket-shaped La Jamais Contente, driven by Camille Jenatzy, which broke the 100 km/h (62 mph) speed barrier by reaching a top speed of 105.88 km/h (65.79 mph) on 29 April 1899. In the early 1990s, the California Air Resources Board (CARB) began a push for more fuel-efficient, lower-emissions vehicles, with the ultimate goal being a move to zero-emissions vehicles such as electric vehicles. In response, automakers developed electric models, including the Chrysler TEVan, Ford Ranger EV pickup truck, GM EV1, and S10 EV pickup, Honda EV Plus hatchback, Nissan Altra EV miniwagon, and Toyota RAV4 EV. 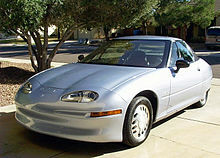 Both US Electricar and Solectria produced 3-phase AC Geo-bodied electric cars with the support of GM, Hughes, and Delco. These early cars were eventually withdrawn from the U.S. market. California electric automaker Tesla Motors began development in 2004 on what would become the Tesla Roadster (2008), which was first delivered to customers in 2008. The Roadster was the first highway legal serial production all-electric car to use lithium-ion battery cells, and the first production all-electric car to travel more than 320 km (200 miles) per charge. Tesla global sales passed 250,000 units in September 2017. The Renault–Nissan–Mitsubishi Alliance achieved the milestone of 500,000 units electric vehicles sold in October 2017. Tesla sold its 200,000th Model S in the fourth quarter of 2017. Global Leaf sales passed 300,000 units in January 2018, keeping its record as the world's top selling plug-in electric car ever. Tesla delivered its 100,000th Model 3 in October 2018. Many countries have set goals to ban the sales of gasoline and diesel powered vehicles in the future, notably; Norway by 2025, China by 2030, India by 2030, Germany by 2030, France by 2040, and Britain by 2040 or 2050. Similarly, more cities around the world have begun transitioning public transportation towards electric vehicles, than previously was the case. As of 2019[update], electric cars are less expensive to run than comparable internal combustion engine cars due to the lower cost of repairs and energy, but cost significantly more to initially buy. According to a study done in 2018, the average operating cost of an electric vehicle in the United States is $485 per year, as opposed to an internal combustion engine's $1,117 per year. The main cost driver of an electric car is its battery. The price was €600 per kWh in 2010, €170 in 2017, and €100 in 2019. The same is true of ICE vehicles. The sourcing of fossil fuels (oil well to tank) causes further damage and use of resources during the extraction and refinement processes,including high amounts of electricity. 2 emissions by driving an electric car in comparison to travelling with a gasoline-powered car. In December 2016, Nissan reported that Leaf owners worldwide achieved the milestone of 3 billion kilometers (1.9 billion miles) driven collectively through November 2016. Over half of the world's cobalt, a key element in lithium-ion batteries, is mined in the Democratic Republic of Congo where the children are forced to mine the cobalt while having little to no protection. It is estimated that there are sufficient lithium reserves to power 4 billion electric cars. Most electric cars use a lithium-ion battery and an electric motor which uses rare-earth elements. The demand for lithium, heavy metals, and other elements (such as neodymium, boron and cobalt) required for the batteries and powertrain is expected to grow significantly due to the future sales increase of plug-in electric vehicles in the mid and long term. Some of the largest world reserves of lithium and other rare metals are located in countries with strong resource nationalism, unstable governments or hostility to U.S. interests, raising concerns about the risk of replacing dependence on foreign oil with a new dependence on hostile countries to supply strategic materials. Electric motors can provide high power-to-weight ratios, batteries can be designed to supply the currents needed to support these motors. Electric motors have flat torque curve down to zero speed. For simplicity and reliability, many electric cars use fixed-ratio gearboxes and have no clutch. Many electric cars have motors that have high acceleration, relative to comparable cars. This is largely due to the more reduced drivetrain losses and more quickly available torque of an electric motor, which often increase the acceleration relative to a similar motor power internal combustion engine. However Neighborhood Electric Vehicles may have a low acceleration due to their relatively weak motors. Electric vehicles can also use a direct motor-to-wheel configuration which increases the available power. Having motors connected directly to each wheel allows the wheels to be used both for propulsion and as braking systems, thereby increasing traction. When not fitted with an axle, differential, or transmission, electric vehicles have less drive-train inertia. For example, the Venturi Fetish delivers supercar acceleration despite a relatively modest 220 kW (300 hp), and top speed of around 160 km/h (100 mph). Some DC-motor-equipped drag racer EVs have simple two-speed manual transmissions to improve top speed. The Tesla Roadster (2008) 2.5 Sport can accelerate from 0 to 97 km/h (0 to 60 mph) in 3.7 seconds with a motor rated at 215 kW (288 hp). Tesla Model S P100D (Performance / 100kWh / 4-wheel drive) is capable of 2.28 seconds for 0–60 mph at a price of $140,000 . As of May 2017[update], the P100D is the second fastest production car ever built, taking only 0.08 seconds longer for 0–97 km/h (0–60 mph), compared to a $847,975 Porsche 918 Spyder. The electric supercar Rimac Concept One can go from 0–97 km/h (0–60 mph) in 2.5 seconds. The upcoming Tesla Roadster is announced to go 0–60 mph (0–97 km/h) in 1.9 seconds. Internal combustion engines have thermodynamic limits on efficiency, expressed as fraction of energy used to propel the vehicle compared to energy produced by burning fuel. Gasoline engines effectively use only 15% of the fuel energy content to move the vehicle or to power accessories, and diesel engines can reach on-board efficiency of 20%, while electric vehicles have efficiencies of 69-72%, when counted against stored chemical energy, or around 59-62%, when counted against required energy to recharge. While heating can be provided with an electric resistance heater, higher efficiency and integral cooling can be obtained with a reversible heat pump. PTC junction cooling is also attractive for its simplicity — this kind of system is used, for example, in the Tesla Roadster (2008). To avoid using part of the battery's energy for heating and thus reducing the range, some models allow the cabin to be heated while the car is plugged in. For example, the Nissan Leaf, the Mitsubishi i-MiEV, Renault Zoe and the Tesla Model S and 3 can be pre-heated while the vehicle is plugged in. Some electric cars, for example the Citroën Berlingo Electrique, use an auxiliary heating system (for example gasoline-fueled units manufactured by Webasto or Eberspächer) but sacrifice "green" and "Zero emissions" credentials. Cabin cooling can be augmented with solar power external batteries and USB fans or coolers, or by automatically allowing outside air to flow through the car when parked. Two models of the 2010 Toyota Prius include this feature as an option. Like their internal combustion engine counterparts, electric vehicle batteries can catch fire after a crash or mechanical failure. Plug-in electric vehicle fire incidents have occurred, albeit less per mile than I.C.E vehicles. The first modern crash-related fire was reported in China in May 2012, after a high-speed car crashed into a BYD e6 taxi in Shenzhen. The second reported incident occurred in the United States on October 1, 2013, when a Tesla Model S caught fire over ten minutes after the electric car hit metal debris on a highway in Kent, Washington state, and the debris punctured one of 16 modules within the battery pack. A third reported fire occurred on October 18, 2013 in Merida, Mexico. In this case the vehicle was being driven at high speed through a roundabout and crashed through a wall and into a tree. The fire broke out several minutes after the driver exited the vehicle. In the United States, General Motors ran in several cities a training program for firefighters and first responders to demonstrate how to safely disable the Chevrolet Volt’s powertrain and its 12 volt electrical system. The Volt's high-voltage system is designed to shut down automatically in the event of an airbag deployment, and to detect a loss of communication from an airbag control module. GM also made available an Emergency Response Guide for the 2011 Volt for use by emergency responders. The guide also describes methods of disabling the high voltage system and identifies cut zone information. Nissan also published a guide for first responders that details procedures for handling a damaged 2011 Leaf at the scene of an accident, including a manual high-voltage system shutdown, rather than the automatic process built-in the car's safety systems. The weight of the batteries themselves usually makes an EV heavier than a comparable gasoline vehicle, in a collision, the occupants of a heavy vehicle will on average, suffer fewer and less serious injuries than the occupants of a lighter vehicle; therefore, the additional weight brings safety benefits (to the occupant) despite having a negative effect on the car's performance. Depending on where the battery is located, it may lower the center of gravity, increasing driving stability, lowering the risk of an accident through loss of control. An accident in a 2,000 lb (900 kg) vehicle will on average cause about 50% more injuries to its occupants than a 3,000 lb (1,400 kg) vehicle. Some electric cars use low rolling resistance tires, which typically offer less grip than normal tires. The Insurance Institute for Highway Safety in America had condemned the use of low speed vehicles and "mini trucks," referred to as neighborhood electric vehicles (NEVs) when powered by electric motors, on public roads. Mindful of this, several companies (Tesla Motors, BMW, Uniti) have succeeded in keeping the body light, while making it very strong. At low speeds, electric cars produced less roadway noise than vehicles propelled by internal combustion engines. Blind or visually impaired people consider the noise of combustion engines a helpful aid while crossing streets, hence electric cars and hybrids could pose an unexpected hazard. Tests have shown that this is a valid concern, as vehicles operating in electric mode can be particularly hard to hear below 20 mph (30 km/h), which affects all road users, not just the visually impaired. At higher speeds, the sound created by tire friction and the air displaced by the vehicle start to make sufficient audible noise. The Government of Japan, the U.S. Congress, and the European Parliament passed legislation to regulate the minimum level of sound for hybrids and plug-in electric vehicles when operating in electric mode, so that blind people and other pedestrians and cyclists can hear them coming and detect from which direction they are approaching. The Nissan Leaf was the first electric car to use Nissan's Vehicle Sound for Pedestrians system, which includes one sound for forward motion and another for reverse. As of January 2014[update], most of the hybrids and plug-in electric and hybrids available in the United States, Japan and Europe make warning noises using a speaker system. The Tesla Model S is one of the few electric cars without warning sounds; Tesla Motors will wait until regulations are enacted. Volkswagen and BMW also decided to only add artificial sounds to their electric drive cars only when required by regulation. Several anti-noise and electric car advocates have opposed the introduction of artificial sounds as warning for pedestrians, as such an introduction is based on vehicle type and not actual noise level, a concern regarding ICE vehicles which themselves are becoming quieter. As of 2018[update], most electric cars have similar driving controls to that of a car with a conventional automatic transmission. Even though the motor may be permanently connected to the wheels through a fixed-ratio gear and no parking pawl may be present the modes "P" and "N" are often still provided on the selector. In this case the motor is disabled in "N" and an electrically actuated hand brake provides the "P" mode. In some cars the motor will spin slowly to provide a small amount of creep in "D", similar to a traditional automatic. When the foot is lifted from the accelerator of an ICE, engine braking causes the car to slow. An EV would coast under these conditions, if it wasn't for regenerative braking which instead provides a more familiar response and recharges the battery to an extent. These features also reduce the use of the conventional brakes, significantly reducing wear and tear and maintenance costs as well as improving vehicle range. 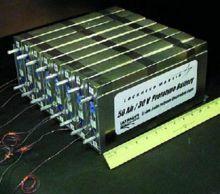 Lithium-based batteries are often chosen for their high power and energy density, although may wear out over a long period of time. However, there are many emerging technologies trying to combat this issue. There are also other battery types, such as Nickel metal hydride (NiMH) batteries which have a poorer power to weight ratio than lithium ion, but are cheaper. Several other battery chemistries are in development such as zinc-air battery which could be much lighter. The range of an electric car depends on the number and type of batteries used, and as with all vehicles, the weight and type of vehicle, performance requirements, and the weather. The majority of electric cars are fitted with a display of expected range. This may take into account many factors of how the vehicle is being used, and what the battery is powering. However, since factors can vary over the route, the estimate can vary from the actual achieved range. The display allows the driver to make informed choices about driving speed and whether to stop at a charging point en route. Some roadside assistance organizations offer charge trucks to recharge electric cars in case of emergency. A study in 2016 stated that 87% of US vehicle-days can be met by current affordable electric cars. Electric cars are typically charged overnight from a charging station installed in the owner's house, or from faster charging stations found in businesses and public areas. An overnight charge of 8 hours will only give about a 40 mile charge with a 120 volt outlet whereas a 240 volt outlet would give around 180 miles in the same amount of time. Within each major region of the world, electric car charging stations are essentially universal across car and charger brands, and simply plugging in a charger into an electric car will charge the car at the fastest rate that car and charger can support. A notable exception are the Tesla line of cars and charging stations, which use their own proprietary chargers. However, this can be solved by using a converter. Some companies have been experimenting with battery swapping to eliminate delay while charging. A “Super Fast” charging location will currently charge most cars to around 80% in 45-50 minutes. The final 20% – as with a mobile phone – takes longer, because the systems slow to safely fill the battery and avoid any risks. Some electric vehicles have built in generators, these are considered a type of hybrid vehicle. As with all lithium-ion batteries, electric vehicle batteries may degrade over long periods of time, especially if they are frequently overcharged, however, this may take at least several years before being noticeable. However, Nissan stated in 2015 that thus far only 0.01 percent of batteries had to be replaced because of failures or problems, and then only because of externally inflicted damage. The vehicles that had already covered more than 200,000 km (124,274 mi), have no problems with the battery. Volkswagen, in collaboration with six partners, is developing an EU research project that is focused on automating the parking and charging of electric vehicles. The objective of this project is to develop a smart car system that allows for autonomous driving in designated areas (e.g. valet parking, park and ride) and can offer advanced driver support in urban environments. Tesla has shown interest in making an arm that automatically charges their vehicles. Experimental supercapacitors and flywheel energy storage devices offer comparable storage capacity, faster charging, and lower volatility. They have the potential to overtake batteries as the preferred rechargeable storage for EVs. The FIA included their use in its sporting regulations of energy systems for Formula One race vehicles in 2007 (for supercapacitors) and 2009 (for flywheel energy storage devices). Solar cars are electric vehicles powered completely or significantly by direct solar energy, usually, through photovoltaic (PV) cells contained in solar panels that convert the sun's energy directly into electric energy, usually used to charge a battery. Qualcomm, Hyundai, Ford, and Mitsubishi are the top patent holders of the close to 800 electric vehicle charging patents filed between 2014 and 2017. A majority of patents on electric vehicle charging were filed in Japan between 2014 and 2017. It is followed by the US and then by China. Battery Electric Vehicles are most commonly charged from the power grid overnight at the owner's house, provided they have their own charging station. The electricity on the grid is in turn generated from a variety of sources; such as coal, hydroelectricity, nuclear and others. Power sources such as photovoltaic solar cell panels, micro hydro or wind may also be used and are promoted because of concerns regarding global warming. Charging stations can have a variety of different speeds of charging, with slower charging being more common for houses, and more powerful charging stations on public roads and areas for trips. The BMW i3 can charge 0–80% of the battery in under 30 minutes in rapid charging mode. The superchargers developed by Tesla Motors provided up to 130 kW of charging, allowing a 300-mile charge in about an hour. Most electric cars have used conductive coupling to supply electricity for recharging after the California Air Resources Board settled on the SAE J1772-2001 standard as the charging interface for electric vehicles in California in June 2001. In Europe, the ACEA has decided to use the Type 2 connector from the range of IEC_62196 plug types for conductive charging of electric vehicles in the European Union, as the Type 1 connector (SAE J1772-2009) does not provide for three-phase charging. Another approach is inductive charging using a non-conducting "paddle" inserted into a slot in the car. Delco Electronics developed the Magne Charge inductive charging system around 1998 for the General Motors EV1 which was also used for the Chevrolet S-10 EV and Toyota RAV4 EV vehicles. During peak load periods, when the cost of generation can be very high, electric vehicles could contribute energy to the grid. These vehicles can then be recharged during off-peak hours at cheaper rates while helping to absorb excess night time generation. Here the batteries in the vehicles serve as a distributed storage system to buffer power. Electric vehicles provide for less dependence on foreign oil, which for the United States and other developed or emerging countries is cause for concern about vulnerability to oil price volatility and supply disruption. Also for many developing countries, and particularly for the poorest in Africa, high oil prices have an adverse impact on their balance of payments, hindering their economic growth. In the United States, presidential candidate Obama proposed in 2008 "1 million plug-in and electric" cars by 2015. At the end of 2015 about 550 thousand plugin-in vehicles had been sold in the US. The Nissan Leaf (left) is the world's top selling highway-legal plug-in electric car ever, with over 400,000 units sold by March 2019, followed by the Tesla Model S (right), with 263,500 units as of December 2018[update].. According to Bloomberg New Energy Finance, as of December 2018[update], there were almost 180 models of highway-capable all-electric passenger cars and utility vans available for retail sales globally. The Renault–Nissan–Mitsubishi Alliance is the world's leading all-electric vehicle manufacturer. Since 2010, the Alliance's global all-electric vehicle sales totaled almost 725,000 units, including those manufactured by Mitsubishi Motors through December 2018, now part of the Alliance. Its best selling Nissan Leaf was the world's top selling plug-in electric car in 2013 and 2014. Tesla is the second all-time best-selling pure electric passenger car manufacturer, with over 530,000 electric cars delivered worldwide through December 2018. After 10 years in the market, Tesla was the world's top selling plug-in electric passenger car manufacturer in 2018, both as a brand and by automotive group, with 245,240 units delivered representing a market share of 12% of all plug-in cars sold globally in 2018. Its Model S was the world's top selling plug-in electric car in 2015 and 2016, and its Model 3 was the world's best selling plug-in electric car in 2018. The world's all-time top selling highway legal electric car is the Nissan Leaf with global sales of over 400,000 units by March 2019, followed by the Tesla Model S with global sales of 263,500 cars as of December 2018[update]. The Renault Kangoo Z.E. utility van is the leader of the light-duty all-electric segment with global sales of 38,527 units through December 2018. (1) Vehicles are considered highway-capable if able to achieve at least a top speed of 100 km/h (62 mph). (2) BMW i3 sales includes the REx variant (split is not available). (3) Sales in main China only. Global sales of highway legal plug-in electric passenger cars and light utility vehicles achieved the one million milestone in September 2015, almost twice as fast as hybrid electric vehicles (HEV). Cumulative global sales of light-duty all-electric vehicles reached one million units in September 2016. Cumulative global sales of plug-in passenger cars passed 2 million in December 2016, the 3 million mark in November 2017, and the 5 million milestone in December 2018. 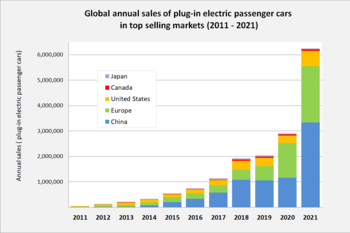 Despite the rapid growth experienced, the global stock of plug-in electric cars represented just about 1 out of every 250 vehicles (0.40%) on the world's roads by the end of 2018. As of December 2018[update], the global stock of pure electric passenger cars and light commercial vehicles (utility vans) totaled about 3.45 million units, representing 65% of all light-duty plug-in vehicles on the world's roads. All-electric cars have oversold plug-in hybrids for several years, and by the end of 2018, the plug-in market continues to shift towards fully electric battery vehicles. The global ratio between annual sales of battery BEVs and PHEVs went from 56:44 in 2012, to 60:40 in 2015, and rose to 69:31 in 2018. Several countries have established grants and tax credits for the purchase of new electric cars, often depending on battery size. The U.S. offers a federal income tax credit up to US$7,500, and several states have additional incentives. The UK offers a Plug-in Car Grant up to a maximum of GB£4,500 (US$5,929). The U.S. government also pledged US$2.4 billion in federal grants for the development of advanced technologies for electric cars and batteries, despite the fact that overall sales aren't increasing at the expected speed. As of April 2011, 15 European Union member states provide economic incentives for the purchase of new electrically chargeable vehicles, which consist of tax reductions and exemptions, as well as of bonus payments for buyers of all-electric and plug-in hybrid vehicles, hybrid electric vehicles, and some alternative fuel vehicles. ^ Roth, Hans (March 2011). Das erste vierrädrige Elektroauto der Welt [The first four-wheeled electric car in the world] (in German). pp. 2–3. ^ a b Guarnieri, M. (2012). "Looking back to electric cars". Proc. HISTELCON 2012 – 3rd Region-8 IEEE HISTory of Electro – Technology Conference: The Origins of Electrotechnologies: 1–6. doi:10.1109/HISTELCON.2012.6487583. ISBN 978-1-4673-3078-7. ^ "Some Facts about Electric Vehicles". Automobilesreview. 2012-02-25. Retrieved 2017-10-06. ^ a b "Birmingham clean air charge: What you need to know". BBC. 13 March 2019. ^ a b c d e Sperling, Daniel; Gordon, Deborah (2009). Two billion cars: driving toward sustainability. Oxford University Press. pp. 22–26. ISBN 978-0-19-537664-7. ^ "Electric Vehicles: Tax Credits and Other Incentives". Department of Energy. US. Retrieved 2018-02-08. ^ "Reducing Pollution with Electric Vehicles | Department of Energy". www.energy.gov. Retrieved 2018-05-12. ^ "How to charge an electric car". Carbuyer. Retrieved 2018-04-22. ^ "2018 Nissan Leaf electric car gets 151-mile EPA range rating". Green Car Reports. Retrieved 2018-04-22. ^ Higgins, Tim (2017-01-20). "Tesla Boosts Range of All-Electric Model S to 335 Miles". Wall Street Journal. ISSN 0099-9660. Retrieved 2018-04-22. ^ a b c "Nissan LEAF first electric car to pass 400,000 sales" (Press release). Yokohama: Nissan. 2019-03-05. Retrieved 2019-03-06. ^ a b c d e f Cobb, Jeff (2018-01-22). "Tesla Quietly Sold 200,000th Model S Last Year". HybridCars.com. Retrieved 2018-01-23. "Tesla sold its 200,000 Model S in the fourth quarter of 2017, in October or early November, becoming the second plug-in car to cross this sales threshold after the Nissan Leaf (300,000 units by early 2017). As of December 2017[update], Tesla reported global sales of 212,874 Model S cars." ^ a b c d e "Tesla Q1 2018 Vehicle Production and Deliveries". Palo Alto: Tesla. 2018-04-03. Retrieved 2018-09-02. Q1 deliveries totaled 11,730 Model S cars and 10,070 Model X. ^ a b c d e "Tesla Second Quarter 2018 Delivery". Palo Alto: Tesla. 2018-07-02. Retrieved 2018-09-02. Q2 deliveries totaled 10,930 Model S cars and 11,370 Model X. ^ a b c d e "Tesla Q3 2018 Vehicle Production and Deliveries". Palo Alto: Tesla. 2018-10-02. Retrieved 2018-10-20. Q3 deliveries totaled 55,840 Model 3 cars, 14,470 Model S, and 13,190 Model X. ^ a b c d e f "Tesla Fourth Quarter 2018 Delivery". Palo Alto: Tesla. 2019-01-05. Retrieved 2019-01-07. Q4 deliveries grew to 90,700 vehicles, which was 8% more than our prior all time-high in Q3. This included 63,150 Model 3 (13% growth over Q3), 13,500 Model S, and 14,050 Model X vehicles. In 2018, we delivered a total of 245,240 vehicles: 145,846 Model 3 and 99,394 Model S and X. ^ a b c Watson, Frank (2019-02-11). "December global electric vehicle sales set new record: S&P Global Platts data". S&P Global Platts. London. Retrieved 2019-02-11. At the end of 2018, some 5.3 million plug-in EVs were on the road A total of 1.45 million light-duty pure electric vehicles were sold in 2018. ^ a b c d e f Jose, Pontes (2019-01-31). "Global Top 20 - December 2018". EVSales.com. Retrieved 2019-01-31. "Global sales totaled 2,018,247 plug-in passenger cars in 2018, with a BEV:PHEV ratio of 69:31, and a market share of 2.1%. The world's top selling plug-in car was the Tesla Model 3, and Tesla was the top selling manufacturer of plug-in passenger cars in 2018, followed by BYD." ^ a b c Hertzke, Patrick; Müller, Nicolai; Schenk, Stephanie; Wu, Ting (May 2018). "The global electric-vehicle market is amped up and on the rise". McKinsey & Company. Retrieved 2019-01-27. See Exhibit 1: Global electric-vehicle sales, 2010-17. ^ "US DEPARTMENT OF TRANSPORTATION National Highway Traffic Safety Administration 49 CFR Part 571 Federal Motor Vehicle Safety Standards". Retrieved 2009-08-06. ^ "Elwell-Parker, Limited". Retrieved 2016-02-17. ^ "Electric Car History". Archived from the original on 2014-01-05. Retrieved 2012-12-17. ^ "World's first electric car built by Victorian inventor in 1884". The Daily Telegraph. London. 2009-04-24. Retrieved 2009-07-14. ^ "Electric automobile". Encyclopædia Britannica (online). Retrieved 2014-05-02. ^ Handy, Galen (2014). "History of Electric Cars". US: The Edison Tech Center. Retrieved 2017-09-07. ^ "Some Facts About Electric Vehicles". 2012-02-25. Retrieved 2017-08-25. ^ Boschert, Sherry (2006). Plug-in Hybrids: The Cars that will Recharge America. New Society Publishers. pp. 15–28. ISBN 978-0-86571-571-4. ^ Kane, Mark (2017-10-04). "Tesla Has Delivered More Than 250,000 EVs, ~55% In The U.S." InsideEVs.com. Retrieved 2017-10-06. ^ "_Update_Letter_2017-3Q.pdf Tesla Third Quarter 2017 Update". Tesla. 2017-11-01. Retrieved 2018-01-10. ^ Caroline Sasia (2017-10-17). "RENAULT-NISSAN-MITSUBISHI SPONSORS WOMEN'S FORUM GLOBAL MEETING". Alliance Renault-Nissan-Mitsubishi. Retrieved 2018-01-23. During the Global Meeting, the Alliance, which recently reached the historic milestone of aggregate sales of 500,000 electric vehicles worldwide (Renault-Nissan-Mitsubishi). ^ "Nissan delivers 300,000th Nissan LEAF" (Press release). Yokohama: Nissan. 2018-01-08. Retrieved 2018-01-14. ^ Halvorson, Bengt (2018-11-08). "Finalist for Green Car Reports Best Car To Buy 2019: Tesla Model 3". Green Car Reports. Retrieved 2018-11-09. ^ Riley, Charles. "Britain bans gasoline and diesel cars starting in 2040". CNNMoney. Retrieved 2018-05-18. ^ "Germany calls for a ban on combustion engine cars by 2030". Engadget. Retrieved 2018-05-18. ^ Petroff, Alanna. "These countries want to ditch gas and diesel cars". CNNMoney. Retrieved 2018-05-18. ^ Forrest, Adam (2017-04-13). "The death of diesel: has the one-time wonder fuel become the new asbestos?". The Guardian. UK. Retrieved 2018-06-27. ^ Carrington, Damian (2017-12-02). "Electric cars already cheaper to own and run than petrol or diesel – study". The Guardian. UK. Retrieved 2018-04-24. ^ Schmidt, Bridie (2018-07-25). "EV vs ICE: The cost gap that is holding Australia back". RenewEconomy. Australia. Retrieved 2018-10-11. ^ Debord, Matthew (2018-01-12). "Everyone is making the same big mistake about electric cars". Business Insider. Australia. Retrieved 2018-10-11. ^ "Fact Sheet – Japanese Government Incentives for the Purchase of Environmentally Friendly Vehicles" (PDF). Japan Automobile Manufacturers Association. Archived from the original (PDF) on 2010-12-26. Retrieved 2010-12-24. ^ Motavalli, Jim (2010-06-02). "China to Start Pilot Program, Providing Subsidies for Electric Cars and Hybrids". The New York Times. Retrieved 2010-06-02. ^ a b "Notice 2009–89: New Qualified Plug-in Electric Drive Motor Vehicle Credit". Internal Revenue Service. 2009-11-30. Retrieved 2010-04-01. ^ Ward, Jonathan (2017-04-28). "EV supply chains: Shifting currents". Automotive Logistics. Archived from the original on 2017-08-03. Retrieved 2017-05-13. ^ a b Stock, Kyle (2018-01-03). "Why early EV adopters prefer leasing — by far". The Automotive News. Retrieved 2018-02-05. ^ "Toyota sees Tesla EV battery cost at ⅓". Reuters. 2011-01-11. ^ "Toyota Adopts Tesla Laptop Strategy for Electric Cars". 2010-12-08. Archived from the original on 2010-12-13. ^ "Tesla says Model S will be profitable thanks to cheaper batteries". ^ McMahon, Jeff. "Electric Vehicles Cost Less Than Half As Much To Drive". Forbes. Retrieved 2018-05-18. ^ "Trotz fallender Batteriekosten bleiben E-Mobile teuer" [Despite falling battery costs electric cars remain expensive]. Umwelt Dialog (in German). Germany. 2018-07-31. Retrieved 2019-03-12. ^ Hauri, Stephan (2019-03-08). "Wir arbeiten mit Hochdruck an der Brennstoffzelle" [We are working hard on the fuel cell]. Neue Zürcher Zeitung (in German). Switzerland. Retrieved 2019-03-12. ^ "Should Pollution Factor Into Electric Car Rollout Plans?". Earth2tech.com. 2010-03-17. Retrieved 2010-04-18. ^ "Electro Automotive: FAQ on Electric Car Efficiency & Pollution". Electroauto.com. Retrieved 2010-04-18. ^ Raut, Anil K. "Role of electric vehicles in reducing air pollution: a case of Katmandu, Nepal". The Clean Air Initiative. Archived from the original on 2016-09-14. Retrieved 2011-01-04. ^ "CO2 Intensity". Eirgrid. Archived from the original on 2011-05-04. Retrieved 2010-12-12. ^ Clark, Duncan (2009-07-17). "Real-time "CO2 intensity" site makes the case for midnight dishwashing". London: Guardian. Retrieved 2010-12-12. ^ Richardson, Jake (2014-12-10). "1 Billion Kilometers Driven By Nissan LEAFs". Clean Technica. Retrieved 2016-10-15. ^ "New Nissan Electric Café opens in Paris as the brand celebrates three billion EV kilometres worldwide" (Press release). Paris: Nissan Newsroom Europe. 2016-12-16. Retrieved 2016-12-17. ^ Cascais, Antonio (2017-11-06). "Child labor still rife in Democratic Republic of Congo". DW.COM. Retrieved 2018-11-30. ^ a b Simon Romero (2009-02-02). "In Bolivia, Untapped Bounty Meets Nationalism". New York Times. Retrieved 2010-02-28. ^ "Página sobre el Salar (Spanish)". Evaporiticosbolivia.org. Archived from the original on 2011-03-23. Retrieved 2010-11-27. ^ "Learn About Lithium – In 10 Bullet Points". ElectroVelocity. 2010-12-13. Retrieved 2011-01-03. ^ Smith, Michael (2009-12-07). "Lithium for 4.8 Billion Electric Cars Lets Bolivia Upset Market". Bloomberg. Retrieved 2011-01-03. ^ a b Irving Mintzer (2009). David B. Sandalow (ed.). Chapter 6: Look Before You Leap: Exploring the Implications of Advanced Vehicles for Import Dependence and Passerger Safety (PDF). The Brookings Institution. pp. 107–126. ISBN 978-0-8157-0305-1. in "Plug-in Electric Vehicles: What Role for Washington?" ^ a b Clifford Krauss (2009-03-09). "The Lithium Chase". New York Times. Retrieved 2010-03-10. ^ Jerry Garret (2010-04-15). "A Case for and Against Electric Cars". New York Times. Retrieved 2010-04-17. ^ "Concept One – The Supercar of the Future. Today". Rimac. Rimac. Retrieved 2017-06-24. ^ "Gas-powered vs. Electric Cars: Which Is Faster?". How Stuff Works. 15 January 2019. ^ Contact Wes Siler: Comment Email Facebook Twitter (2010-04-13). "Helsinki Metropolia University's RaceAbout". Jalopnik.com. Retrieved 2011-12-06. ^ Contact Mike Spinelli: Comment (2007-10-05). "Nissan Pivo 2". Jalopnik.com. Retrieved 2011-12-06. ^ "Charles Perry's Plug-In Hybrid Retrofit Kit". Gizmag.com. Retrieved 2011-12-06. ^ Hedlund, R. (November 2008). "The Roger Hedlund 100 MPH Club". National Electric Drag Racing Association. Retrieved 2009-04-25. ^ "Roadster Sport 2.5 Specifications". Tesla. Archived from the original on 2013-02-12. Retrieved 2013-02-01. ^ Gall, Jared (December 2013). "2015 Porsche 918 Spyder". Car and Driver. US. Retrieved 2017-05-11. ^ DeBord, Matthew (2017-11-17). "The new Tesla Roadster can do 0-60 mph in less than 2 seconds — and that's just the base version". Business Insider. Retrieved 2019-04-22. ^ a b Shah, Saurin D. (2009). "2". Plug-In Electric Vehicles: What Role for Washington? (1st ed.). The Brookings Institution. pp. 29, 37 and 43. ISBN 978-0-8157-0305-1. ^ "Electric Car Myth Buster — Efficiency". CleanTechnica. 2018-03-10. Retrieved 2019-04-18. ^ "Performance Statistics – 1999 General Motors EV1 w/NiMH" (PDF). United States Department of Energy, Office of Energy Efficiency and Renewable Energy. 1999. Retrieved 2009-04-25. ^ "Advanced Vehicle Testing Activity". Full Size Electric Vehicles (Report). Idaho National Laboratory. 2006-05-30. Archived from the original on 2004-10-15. Retrieved 2009-04-25. ^ "Energy Efficiency of Tesla Electric Vehicles". Tesla Motors. Retrieved 2009-04-25. ^ ‹See Tfd›US, "Electrical PTC heating device"
^ NativeEnergy (2012-09-07). "3 Electric Car Myths That Will Leave You Out in the Cold". Recyclebank. Retrieved 2013-07-21. ^ Piotrowski, Ed (2013-01-03). "How i Survived the Cold Weather". The Daily Drive – Consumer Guide Automotive. Retrieved 2013-07-21. ^ "Effects of Winter on Tesla Battery Range and Regen". teslarati.com. 2014-11-24. Retrieved 2015-02-21. ^ "2010 Options and Packages". Toyota Prius. Toyota. Retrieved 2009-07-09. ^ Spotnitz, R.; Franklin, J. (2003). "Abuse behavior of high-power, lithium-ion cells". Journal of Power Sources. 113: 81–100. doi:10.1016/S0378-7753(02)00488-3. ^ "Roadshow: Electric cars not as likely to catch fire as gas-powered vehicles". The Mercury News. 2018-03-29. Retrieved 2018-05-12. ^ China Autoweb (2012-05-28). "Initial details on fiery crash involving BYD e6 that killed 3". Green Car Congress. Retrieved 2012-08-13. ^ Christopher Jensen (2013-10-02). "Tesla Says Car Fire Started in Battery". The New York Times. Retrieved 2013-10-05. ^ Steven Russolillo (2013-10-04). "Musk Explains Why Tesla Model S Caught on Fire". The Wall Street Journal. Retrieved 2013-10-05. ^ General Motors (2011-01-19). "Detroit First Responders Get Electric Vehicle Safety Training". General Motors News. Retrieved 2011-11-12. ^ General Motors (2011-03-31). "First Responder Vehicle Guides". U.S. Fire Administration. Archived from the original on 2011-10-19. Retrieved 2011-11-12. ^ AOL Autos (2011-12-16). "Chevy Volt Unplugged: When To Depower Your EV After a Crash". Translogic. Retrieved 2011-12-20. ^ Nissan (2010). "2011 LEAF First Responder's Guide" (PDF). Nissan North America. Retrieved 2011-12-20. ^ National Research Council; Transportation Research Board; Division on Engineering and Physical Sciences; Board on Energy and Environmental Systems; Committee on the Effectiveness and Impact of Corporate Average Fuel Economy (CAFE) Standards (2002). Effectiveness and Impact of Corporate Average Fuel Economy (CAFE) Standards. National Academies Press. p. 71. ISBN 978-0-309-07601-2. ^ Mehrdad Ehsani; Yimin Gao; Sebastien E. Gay; Ali Emadi (2004). Modern Electric, Hybrid Electric, and Fuel Cell Vehicles: Fundamentals, Theory, and Design. Taylor & Francis. p. 22. ISBN 978-0-8493-3154-1. ^ "Vehicle Weight, Fatality Risk and Crash Compatibility of Model Year 1991–99 Passenger Cars and Light Trucks" (PDF). National Highway Traffic Safety Administration. October 2003. Retrieved 2009-04-25. ^ Crowe, Paul (2008-07-21). "Low Rolling Resistance Tires Save Gas". HorsePower Sports. Retrieved 2009-04-25. ^ "Planned EU Requirements for Tires Would Reduce Road Traffic Safety". Continental AG. 2007-11-12. Retrieved 2011-12-07. ^ Shunk, Chris (2010-05-21). "IIHS condemns use of mini trucks and low-speed vehicles on public roads". autoblog.com. Retrieved 2010-10-15. ^ Nuckols, Ben (2007-03-03). "Blind people: Hybrid cars pose hazard". USA Today. Retrieved 2009-05-08. ^ a b c "Electric cars and noise: The sound of silence". Economist. 2009-05-07. Retrieved 2009-05-08. ^ European Commission Press Release (2014-04-02). "Commission welcomes Parliament vote on decreasing vehicle noise". European Commission. Retrieved 2014-04-03. ^ Jim Motavalli (2010-06-17). "Blind Advocates 'Disappointed' in Nissan E.V. Sounds for Pedestrians". New York Times. Retrieved 2010-06-19. The article includes a sample of the two sounds. ^ Jim Motavalli (2010-06-01). "Electric Car Warning Sounds: Don't Expect Ring Tones". New York Times. Retrieved 2010-06-02. ^ Gabe Nelson (2013-03-01). "Louder EVs may turn off drivers, automakers say". Automotive News. Retrieved 2013-03-21. ^ Dorothee Tschampa (2013-12-30). "Daimler Electrics Get Fake Vroom to Thwart Silent Threat: Cars". Bloomberg. Retrieved 2014-01-01. ^ "Ford Focus BEV – Road test". Autocar.co.uk. Retrieved 2011-01-03. ^ "Why Your Gadgets' Batteries Degrade". Popular Mechanics. 2012-04-25. Retrieved 2018-09-03. ^ Energy Efficiency & Renewable Energy, U.S. Department of Energy and U. S. Environmental Protection Agency and (2017-03-24). "Find a car – Years: 2016–2017 – Vehicle Type: Electric". fueleconomy.gov. Retrieved 2017-03-26. ^ Liasi, Sahand Ghaseminejad, and Masoud Aliakbar Golkar. "Electric vehicles connection to microgrid effects on peak demand with and without demand response." In Electrical Engineering (ICEE), 2017 Iranian Conference on, pp. 1272–1277. IEEE, 2017. ^ "Tesla Quietly Introduces Longest-Range Electric Car on the Market". Fortune. Retrieved 2018-05-20. ^ "AAA says that its emergency electric vehicle charging trucks served "thousands" of EVs without power". Electrek. Retrieved 6 September 2016. ^ Ferris, Robert (2016-08-17). "Electric cars good enough for 90 percent of trips". CNBC. Retrieved 2016-08-17. ^ Needell, Zachary A.; McNerney, James; Chang, Michael T.; Trancik, Jessika E. (2015-12-31). "Potential for widespread electrification of personal vehicle travel in the United States : Nature Energy". Nature Energy. 1 (9). doi:10.1038/nenergy.2016.112. ^ "Thinking of buying an electric vehicle? Here's what you need to know about charging". USA TODAY. Retrieved 2018-05-20. ^ "Electric Vehicle Charging: Types, Time, Cost and Savings". Union of Concerned Scientists. US. 2018-03-09. Retrieved 2018-11-30. ^ "Diginow Super Charger V2 opens up Tesla destination chargers to other EVs". Autoblog. Retrieved 2018-09-03. ^ "Could Battery Swapping Ease Range Anxiety for EV Owners?". Machine Design. 2016-07-19. Retrieved 2018-05-20. ^ "Electric Cars - everything you need to know » EFTM". EFTM. 2019-04-02. Retrieved 2019-04-03. ^ "Understanding the life of lithium ion batteries in electric vehicles". Retrieved 2018-09-03. ^ „zeit.de: Batterie-Upgrade? Unwahrscheinlich!“; retrieved, 22 February 2016. ^ "VCharge". Oxford Robotics Institute. Retrieved 2018-03-06. ^ "Tesla's prehensile car charger plugs itself in automatically". Engadget. Retrieved 2018-05-20. ^ Schindall, Joel (November 2007). "The Charge of the Ultra – Capacitors Nanotechnology takes energy storage beyond batteries". IEEE Spectrum. Retrieved 2010-08-12. ^ "Electric Vehicle Charging Technology Insights | Patent Landscape". Netscribes. 2018-03-06. Retrieved 2018-03-06. ^ "The Future of Electric Vehicle Charging | Netscribes". www.netscribes.com. Retrieved 2018-03-06. ^ "Alternative Fuels Data Center: Developing Infrastructure to Charge Plug-In Electric Vehicles". www.afdc.energy.gov. Retrieved 2018-09-03. ^ "Charging time for the BMW i3". UK: BMW. Archived from the original on 2013-09-21. Retrieved 2013-09-12. ^ Popely, Rick (November 9, 2013). "How Quickly does the tesla model S battery charge?". Cars.com. ^ "ACEA position and recommendations for the standardization of the charging of electrically chargeable vehicles" (PDF). ACEA Brussels. 2010-06-14. Archived from the original (PDF) on 2011-07-06. ^ "Groupe Renault begins large-scale vehicle-to-grid charging pilot". Renewable Energy Magazine. 22 March 2019. ^ Mitchell, William J.; Borroni-Bird, Christopher; Burns, Lawrence D. (2010). Reinventing the Automobile: Personal Urban Mobility for the 21st Century (1st. ed.). The MIT Press. pp. 85–95. ISBN 978-0-262-01382-6. Retrieved 2013-07-21. See Chapter 5: Clean Smart Energy Supply. ^ R. James Woolsey and Chelsea Sexton (2009). David B. Sandalow (ed.). Chapter 1: Geopolitical Implications of Plug-in Vehicles (1st ed.). The Brookings Institution. pp. 11–21. ISBN 978-0-8157-0305-1. in "Plug-in Electric Vehicles: What Role for Washington?" ^ "High oil prices disastrous for developing countries". Mongabay. 2007-09-12. Retrieved 2010-07-20. ^ "Impact of High Oil Prices on African Economies" (PDF). African Development Bank. 2009-07-29. Retrieved 2010-07-20. ^ "Obama Calls for 1 Million Plug-in Hybrids by 2015". Hybrid Cars. Canada. 2008-08-05. Retrieved 2017-04-09. ^ "Electric Drive Sales". electricdrive.org. 2017. Retrieved 2017-04-09. ^ Stock, Kyle (2018-12-18). "In the Switch to Electric Vehicles, Expect a Few Giants to Crash". Bloomberg L.P. Retrieved 2019-01-15. Move the pointing device over the graph "Models for sale Globally" - Figure reported is for 4Q 2018. ^ "Alliance members achieve combined sales of 10.76 million units in 2018". Groupe Renault Media (Press release). Paris. 2019-01-30. Retrieved 2019-02-02. As of December 2018, a total of 724,905 electric vehicles have been sold by the Alliance since 2010. ^ a b c d Cobb, Jeff (2017-01-26). "Tesla Model S Is World's Best-Selling Plug-in Car For Second Year In A Row". HybridCars.com. Retrieved 2017-01-26. See also detailed 2016 sales and cumulative global sales in the two graphs. ^ Kane, Mark (2019-01-02). "Tesla Production And Deliveries Graphed Through Q4 2018". InsideEVs.com. Retrieved 2019-01-02. ^ Jose, Pontes (2019-02-03). "2018 Global Sales by OEM". EVSales.com. Retrieved 2019-02-03. "Tesla led plug-in car sales among automotive groups in 2018, with 245,240 units delivered, followed by BYD with 229,338, and the Renault-Nissan Alliance with 192,711." ^ "BMW sells over 140,000 plug-in cars throughout 2018". electricdrive.com. 2019-01-10. Retrieved 2019-01-14. The global share of plug-in electric cars by brand in 2018 was led by Tesla with 12%, followed by BYD with 11%, BMW with 9%, BAIC with 6%, and Roewe and Nissan, both with 5%. ^ Sharan, Zachary (2017-02-04). "Tesla Model S & Nissan LEAF Clocked As World's Best-Selling Electric Cars In 2016". EV Volumes. CleanTechnica.com. Retrieved 2017-02-04. ^ Cobb, Jeff (2016-01-12). "Tesla Model S Was World's Best-Selling Plug-in Car in 2015". HybridCars.com. Retrieved 2016-01-23. ^ a b Groupe Renault (January 2019). "Ventes Mensuelles - Statistiques commerciales mensuelles du groupe Renault" [Monthly Sales - Monthly sales statistics of the Renault Group] (in French). Renault.com. Retrieved 2019-01-20. Sales figures includes passenger and light utility variants. Click on link "XLSX - 142 Ko Ventes mensuelles du Groupe (Décembre 2018)" to download the file, and open the tab "Sales by Model" to access sales figures for 2017 and 2018. ^ "Nissan LEAF e+ debuts, broadens best-selling electric vehicle's appeal" (Press release). Yokohama: Nissan. 2019-01-08. Retrieved 2019-01-10. ^ "BAIC Beijing EC180". Carsalesbase.com. January 2019. Retrieved 2019-01-28. Sales of the BAIC EC series totaled 4,128 units in 2016, 78,079 in 2017 and 90,637 in 2018. ^ "Tesla Fourth Quarter & Full Year 2018 Update". Palo Alto: Tesla. 2019-01-30. Retrieved 2019-01-30. In Q4, we delivered 63,359 Model 3 vehicles to customers in North America. ^ "Tesla Fourth Quarter & Full Year 2017 Update" (PDF). Tesla (Press release). Palo Alto: Tesla. 2017-02-07. Retrieved 2018-10-20. A total of 1,542 Model 3 vehicles were delivered in Q4 2018. ^ "Record sales for BMW Group worldwide during 2017 while it boosts the Premium car market in Mexico, Latin America and the Caribbean" (Press release). Mexico City: BMW Group. 2018-01-25. Retrieved 2016-01-17. A total of 31,482 BMW i3s were delivered globally in 2017. ^ "BMW Group remains world's leading premium automotive company in 2018" (Press release). Munich: BMW Group. 2019-01-14. Retrieved 2019-01-14. A total of 142,617 electrified BMW and MINI vehicles were sold around the world in 2018. BMW i3 sales increased by 10.6% in 2018 with a total of 34,829 delivered worldwide. ^ Mat Gasnier (2014-07-19). "World Full Year 2013: Discover the Top 1000 best-selling models!". Best Selling Cars Blog. Retrieved 2014-07-27. A total of 1,477 i3s were registered in 2013. Includes press fleet vehicles and dealer demonstrators. ^ "BMW Group sells more than 2 million vehicles in 2014" (Press release). Munich: BMW Group PressClub Global. 2015-01-09. Retrieved 2015-01-10. A total of 16,052 i3s and 1,741 i8s were sold in 2014. ^ "BMW Group achieves fifth consecutive record sales year" (Press release). Detroit/Munich: BMW Group. 2016-01-11. Retrieved 2016-01-17. A total of 29,513 BMW i brand units were delivered to customers worldwide in 2015, up 65.9% from 2014, consisting of 24,057 BMW i3s and 5,456 BMW i8s. ^ Tesla, Inc. (2017-04-02). "Tesla Q1 2017 Vehicle Production and Deliveries" (Press release). Palo Alto: Market Wired. Retrieved 2018-05-26. Tesla (NASDAQ: TSLA) delivered just over 25,000 vehicles in Q1, of which approx 13,450 were Model S and approx 11,550 were Model X. ^ "UPDATE - Tesla Q2 2017 Vehicle Production and Deliveries (NASDAQ:TSLA)". ir.tesla.com. Retrieved 2017-09-28. ^ "Telsa Production Q3 2017". Retrieved 2018-05-26. ^ "China's new energy PV wholesale volume in 2018 shoots up 83% year on year". Gasgoo. 2019-01-11. Retrieved 2019-01-15. The BAIC EC series ranked as China's top selling plug-in car in 2018 with 90,637 units delivered, and the Chery eQ listed second with 46,967 units (4,732 sold in December). ^ Pontes, Jose (2018-11-30). "Global All-Time Top 5 (Until Oct. '18 - Updated)". EVSales.com. Retrieved 2018-12-03. ^ Pontes, Jose (2018-12-21). "China November 2018". EVSales.com. Retrieved 2019-01-15. A total of 4,352 Chery eQ electric cars were sold in November 2018. ^ Jeff Cobb (2015-09-16). "One Million Global Plug-In Sales Milestone Reached". HybridCars.com. Retrieved 2015-09-16. Cumulative global sales totaled about 1,004,000 highway legal plug-in electric passenger cars and light-duty vehicles by mid-September 2015, of which, 62% are all-electric cars and vans, and 38% plug-in hybrids. ^ Nic Lutsey (2015-09-29). "Global milestone: The first million electric vehicles". International Council on Clean Transportation (ICCT). Retrieved 2015-10-10. ^ Cobb, Jeff (2017-01-18). "The World Just Bought Its Two-Millionth Plug-in Car". HybridCars.com. Retrieved 2017-01-17. An estimated 2,032,000 highway-legal plug-in passenger cars and vans have been sold worldwide at the end of 2016. The top selling markets are China (645,708 new energy cars, including imports), Europe (638,000 plug-in cars and vans), and the United States (570,187 plug-in cars). The top European country markets are Norway (135,276), the Netherlands (113,636), France (108,065), and the UK (91,000). Total Chinese sales of domestically produced new energy vehicles, including buses and truck, totaled 951,447 vehicles. China was the top selling plug-in car market in 2016, and also has the world's largest stock of plug-in electric cars. ^ Vaughan, Adam (2017-12-25). "Electric and plug-in hybrid cars whiz past 3m mark worldwide". The Guardian. Retrieved 2018-01-20. "The number of fully electric and plug-in hybrid cars on the world’s roads passed the 3 million mark in November 2017." ^ a b International Energy Agency (IEA), Clean Energy Ministerial, and Electric Vehicles Initiative (EVI) (May 2018). "Global EV Outlook 2017: 3 million and counting" (PDF). IEA Publications. Retrieved 2018-10-23. CS1 maint: Multiple names: authors list (link) See pp. 9–10, 19–23, 29–28, and Statistical annex, pp. 107–113. The global stock of plug-in electric passenger cars totaled 3,109,050 units, of which, 1,928,360 were battery electric cars..
^ Argonne National Laboratory, United States Department of Energy (2016-03-28). "Fact #918: March 28, 2016 – Global Plug-in Light Vehicles Sales Increased By About 80% in 2015". Office of Energy Efficiency & Renewable Energy. Retrieved 2016-03-29. ^ European Automobile Manufacturers Association (ACEA) (2017-02-01). "New Passenger Car Registrations By Alternative Fuel Type In The European Union: Quarter 4 2016" (PDF). ACEA. Retrieved 2018-10-23. See table New Passenger Car Registrations By Market In The EU + EFTA - Total Electric Rechargeable Vehicles: Total EU + EFTA in Q1-Q4 2015. ^ European Automobile Manufacturers Association (ACEA) (2018-02-01). "New Passenger Car Registrations By Alternative Fuel Type In The European Union: Quarter 4 2017" (PDF). ACEA. Retrieved 2018-10-23. See table New Passenger Car Registrations By Market In The EU + EFTA - Total Electric Rechargeable Vehicles: Total EU + EFTA in Q1-Q4 2017 and Q1-Q4 2016. ^ "Electric car grant: the lowdown on the changes for 2016". London: Go Ultra Low. 2016-03-02. Retrieved 2016-03-02. ^ Woodyard, Chris (2010-07-14). "Obama pushes electric cars, battery power this week". USA Today. ^ Swann, Albert (2017-10-28). "On the Future of Electric Cars – Far From a Sure Thing?". Motorward. ^ Paul Hockenos (2011-07-29). "Europe's Incentive Plans for Spurring E.V. Sales". The New York Times. Retrieved 2011-07-31. 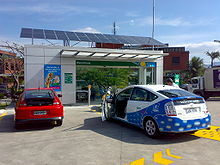 Wikimedia Commons has media related to Electrically powered automobiles. Look up electric car in Wiktionary, the free dictionary.